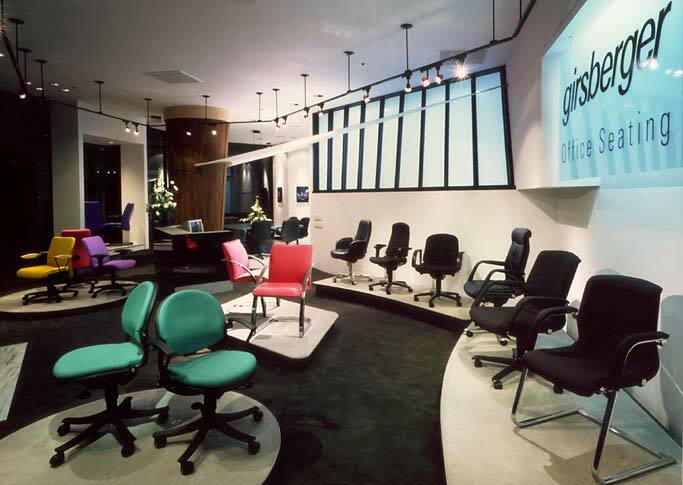 This project was the second showroom I designed for the client in the Pacific Design Center, the premier location for amnufactuerers of commercial furnishings and building materials in Southern California. This tenant space has a much better location of the building right at the top of a main escalator bank. The client and I already had a highly productive working relationship from the sucess of the previous showroom, which made communication faster and more productive--especially since the American company headquarters is in North Carolina, and we could only meet infrequently. The American company needed to obtain approval for key decisions from its Swiss headquarters, so I had to present and express design concept ideas very clearly for distant presentations. The design went though a number of iterantions and as it approached final approval I built a scale model to show what the finished showroom would look like. This model was expremely useful and accuratly depicted what the final showroom would look like. 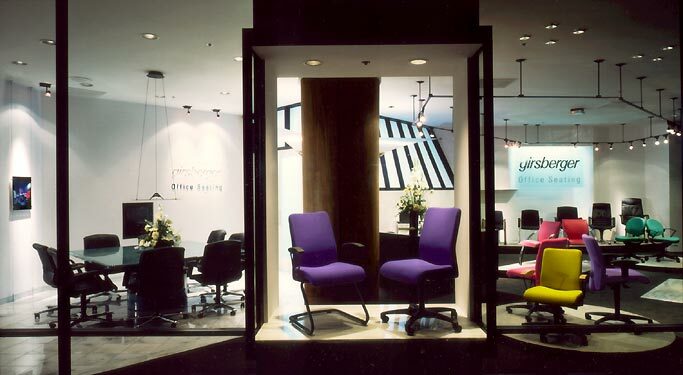 The project was awared "Best new Showroom or Retail Store Design" by the Los Angeles chapter of the American Society of Interior Designers in 1995. 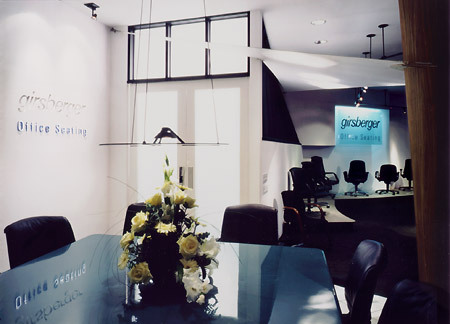 Girsberger product showroom, retail store design, Pacific Design Center, West Hollywood, California. 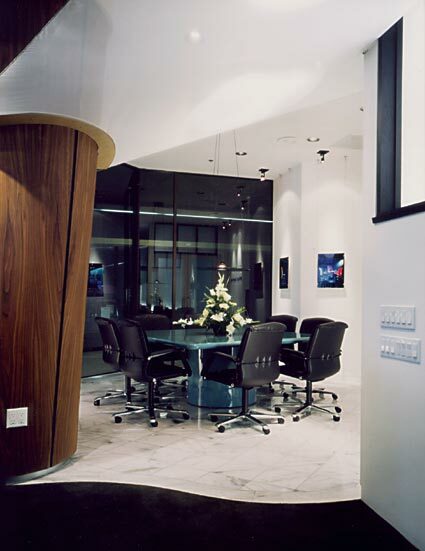 Interior, lighting, signage design. Architectural renderings and scale models, renderings, sketches and visualizations by Mike Roy. This project let me explore one of my favorite specialties--designing architectural signage. 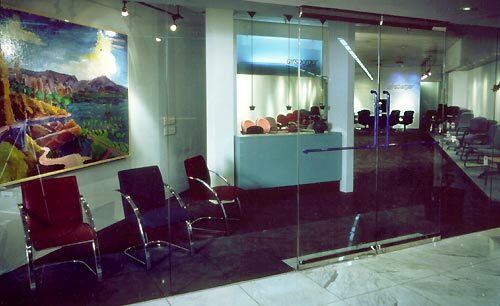 At the conference area I receseed the Girsberger name into the wall, so that it appears to be carved out of the wall itself, and specified transparent blue letters with polished chrome faces for the words "Office Seating" so that the words shimmer in and out of sight as the viewer moves past them. I incorporated a motion picture lighting technique--directing highly specular brights lights through translucent silk fabric--into the architecture. The result is soft modeling on the black leather chairs without creating too much contrast against the white wall behind them, as well as a visually dynamic sculptural form floating over Girsberger's most upscale products. 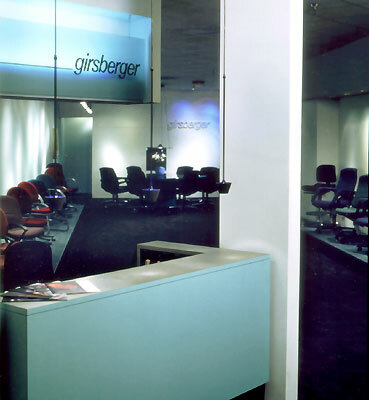 This showroom was the first of a series of projects I designed for Girsberger. The tenant space was a typical "storefront" layout, long and narrow. I borrowed a number of techniques from the Renaissance to shorten the perspective depth of the showroom. The repeated "Girsberger" signage suggests that both signs are about the same size--actually the sign on the back wall is much larger than the backlit sign over the reception desk. The conference table at the rear of the space is over-scale, adding to the illusion that the back wall is closer to the storefront than it really is. When the more desirable location for the showroom became available two years after the construction of this one, I designed the showroom shown at the top of the page. I was able to re-use some furnishings from the original showroom (the reception desk and conference table) saving some costs. 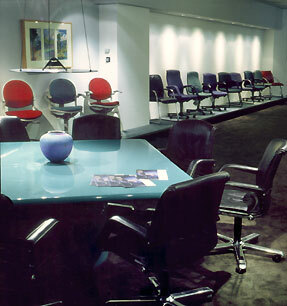 The 1992 showroom was named "Best New Commercial Product Showroom" at that year's "Westweek" trade show hosted by the Pacific Design Center.